Borrowing terminology from the economic discipline�specifically the concept of "capital"�has led to an abundance of new terms in the social sciences: human capital, social capital, and cultural capital, to name the most prominent representatives on an ever-growing list. In this interdisciplinary transaction, the concept is borrowed and the original meaning extended until the new concepts often have nothing left in common with their initial referents. Here Jacek Tittenbrun offers a critical analysis of human, social, and cultural capital on the basis of their uses and misuses across a wide range of social sciences, simultaneously revealing the source of conceptual diffusion in the real world. 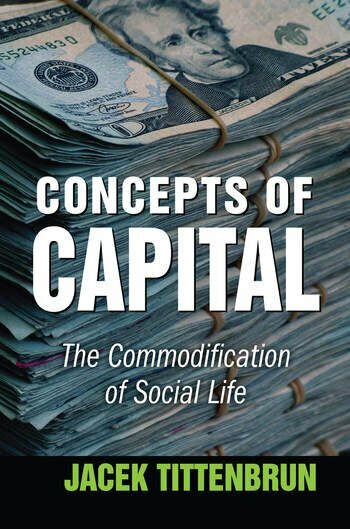 He presents a two-pronged analysis of an intellectual fashion popular in the social sciences and offers a critical analysis of a range of concepts constructed around the common core of "capital." The analysis is innovative, as it is underpinned by a theoretical framework rooted in economic sociology and the concept of ownership in particular. The approach is one of the sociology of knowledge coupled with a substantive critique-application of the given concepts. The volume reveals a range of processes in the real world that account for the conceptual diffusion. The general reader will be drawn to the discussion in the second half of the book, a study of a variety of relatable real life situations that illuminate privatization and commodification in our lives.